These group rates are available for groups of 15 or more. Advanced reservations made less than a week in advance are subject to an additional $1 per person fee. Vesterheim Welcomes Special Groups and Bus Tours! We offer guided tours of the museum’s Main Building, the Heritage Park, or both. The standard tour for each lasts approximately 60-75 minutes, or we can create a personalized tour program that fits your schedule. 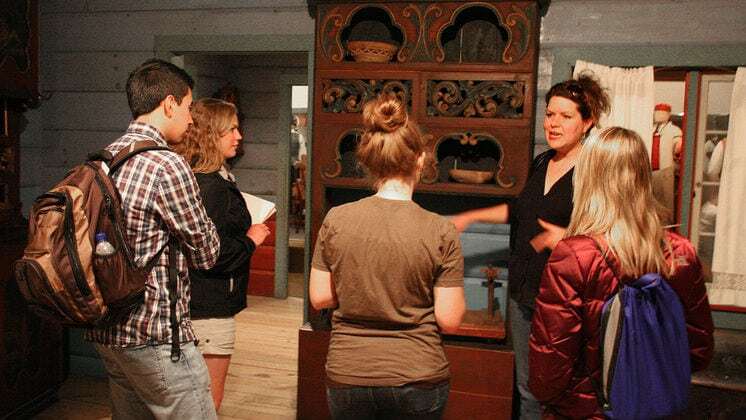 We also can arrange a themed tour around a topic like immigration, woodcarving, rosemaling, textiles, or fine art, or a behind-the-scenes tour of one of our state-of-the-art collection storage facilities. Just ask! Special group tours include general admission to the museum for the entire day. The museum’s Main Building has four floors to explore, including three exhibition galleries that change regularly. Vesterheim also has a Heritage Park located behind the museum’s Main Building. This collection of 12 historic buildings is open from May 1 to October 31. For your convenience, disembark at the Bruening Visitor Center on the corner of Water and Mechanic Streets. 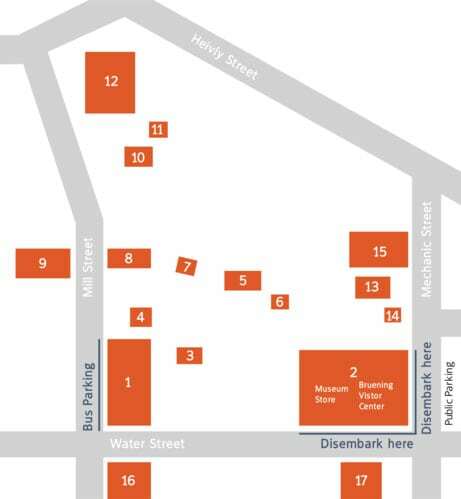 Motorcoach parking is located on Mill Street between Water Street and Heivly Street. Vesterheim staff members are available to give presentations to cultural, community, and church groups on a variety of topics. Vesterheim’s Museum Store is located in the Education Center. If your group would like to visit the store, please let us know when you make the reservation for your group visit, so that we can accommodate this into the schedule. Accessibility: All areas of the Main Building, Westby-Torgerson Education Center, Amdal-Odland Heritage Center, and the Bethania Church are wheelchair accessible, but some of the historic buildings in the Heritage Park are not. We apologize for any inconvenience. Please let us know if any member of your party requires special accommodation or assistance. Photography: You may take non-flash photos throughout the museum complex for personal, noncommercial use only, and we encourage you to share your favorite shots on Facebook, Flickr, TripAdvisor, Yelp, and other social media sites. All flash photography is prohibited and commercial use of images of Vesterheim’s collections or grounds is strictly forbidden without prior written consent. High-quality images of artifacts are available for a fee. Objects in the museum may not be touched unless otherwise noted by signs or by the guide. This is to protect the objects from dirt and damage. Food, drink, gum, and candy are not allowed in the museum’s Main Building or Heritage Park buildings. There are single restrooms with changing tables located on the first, second, and third floors of the museum’s Main Building. Multi-stall restrooms with changing tables are located in the museum’s Education Center. If your group will need a restroom break upon arrival, please let the museum know when you make the reservation for your visit so that we can accommodate this into the schedule. All floors of the museum’s Main Building and Education Center are accessible by elevator and are climate-controlled. Buildings in the Heritage Park are accessible by steps and are not climate-controlled. Photographs and video may be taken without flash or floodlights. There are several areas that are ideal for bus parking, including alongside the Main Building on Mill Street and beside the Education Center on Mechanic Street. Bus drivers are always welcome to join the group for no charge. Lunches or snacks may be eaten in the Heritage Park if prior arrangements have been made. The museum may also be able to provide an indoor space for eating. Please inquire. Guest wifi access is available in the Main Building and Westby-Torgerson Education Center. Vesterheim’s Museum Store is located in the Education Center. If your group would like to visit the store, please let the museum know when you make the reservation for your group visit, so that we can accommodate this into the schedule.